Sat., June 14, 2014, 4:34 p.m.
Idaho’s state Republican Party convention degenerated into a fiasco Saturday after attempts to disqualify up to a third of the delegates attending appeared to be succeeding – and the convention ended up adjourning without electing a chairman, setting a platform or doing any of it scheduled business. 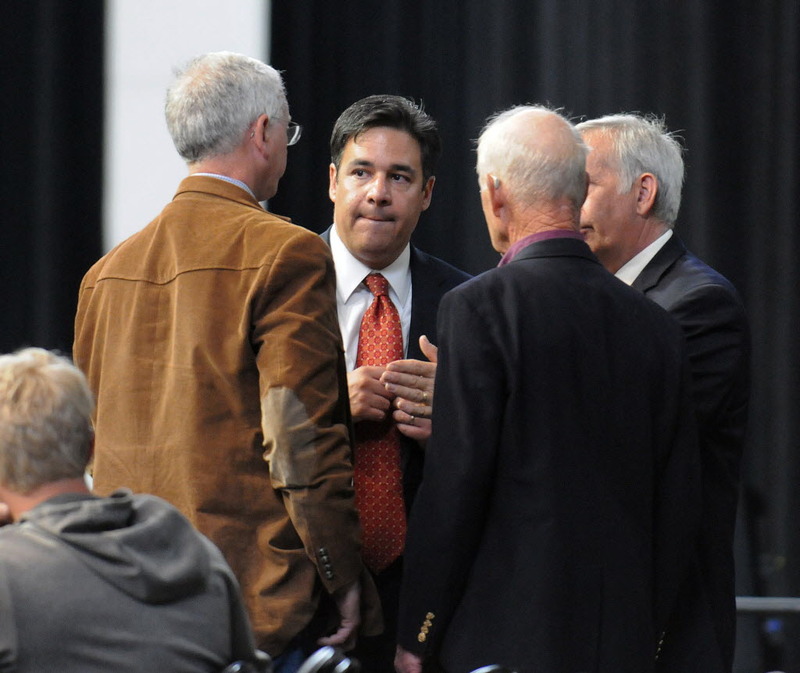 “For three weeks I’ve tried to broker a deal to prevent what happened today,” 1st District Idaho Congressman Raul Labrador told Idaho Public Television just after the convention adjourned, but he failed; Labrador was the convention chairman. “It’s hard to blame all this on Raul Labrador, but on the other hand, this does not strengthen his credentials for a national leadership position, either,” said BSU professor emeritus Jim Weatherby, a longtime observer of Idaho politics. Far from uniting the deeply divided party, the gathering in Moscow degenerated into dysfunction - though it’s the party that holds every statewide office in Idaho, every seat in the congressional delegation and more than 80 percent of the seats in the state Legislature. It also proved not to be the finest hour for Labrador, whom many looked to as the healer for the fractured party just a day after he announced that he’s running for Majority Leader of the U.S. House; instead, he ended the convention facing jeers and walkouts from his own party members. Weatherby said the only comparable event he could think of was Nevada’s GOP convention fiasco in 2008, which was canceled before delegates to the national convention had been selected. “And again, Ron Paul forces or libertarian forces were involved in that fiasco as well,” Weatherby said. Libertarian and tea party forces had lost badly in most parts of the state in the May 20 Idaho GOP primary - though they were ascendant in North Idaho - but geared up to keep control of the party anyway at the state convention. State Sen. Bob Nonini, R-Coeur d’Alene, made the motion to adjourn at 3 p.m. on Saturday; a challenge to the move failed, as many delegates walked out. “I heard people on both sides say that this is the last time they’re going to come to a state convention,” Davlin said. The failure of the convention means a full day of laboring Friday over resolutions, rules and platform planks was for naught. Committees had recommended resolutions to repeal Idaho’s state health insurance exchange, encourage Bible study in public schools and oppose Common Core state standards for student achievement, among others. The platform committee had agreed on one major change in the party platform: Doing away with its current clause calling for repeal of the 17th Amendment to the U.S. Constitution, which requires direct election of U.S. senators. Repealing the amendment would return that choice to state legislatures, instead of voters. However, that plank will now stay in the state GOP platform for the next two years. Current party Chairman Barry Peterson, who is aligned with the libertarian/tea party wing, will stay in office unless it’s determined that his term has expired; if so, the state central committee could name a replacement. Published: June 14, 2014, 4:34 p.m.